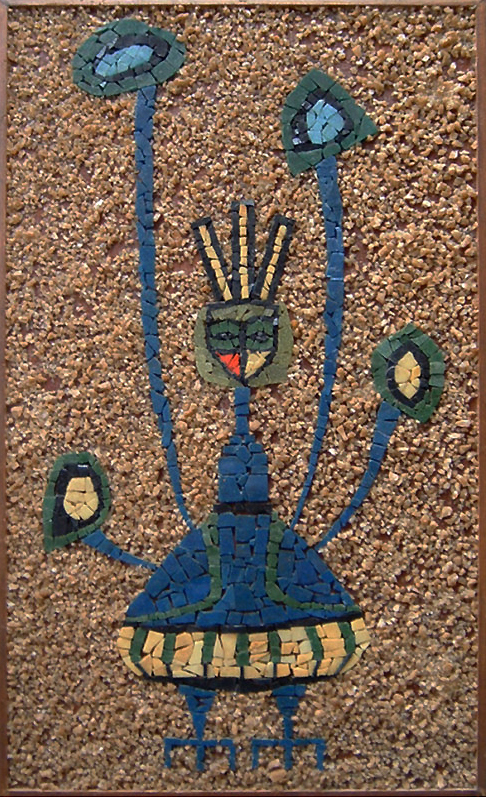 MID-CENTURIA : Art, Design and Decor from the Mid-Century and beyond: Evelyn Ackerman Mosaic? POST UPDATE: The mystery is solved see the comment below from Laura Ackerman-Shaw. 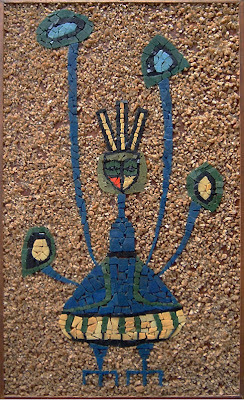 I just came across this bird mosaic on ebay and recognized the design as being from Evelyn Ackerman. In fact, the same "Peacock" design is on a tapestry that is currently being offered at Lawson-Fenning for $875. 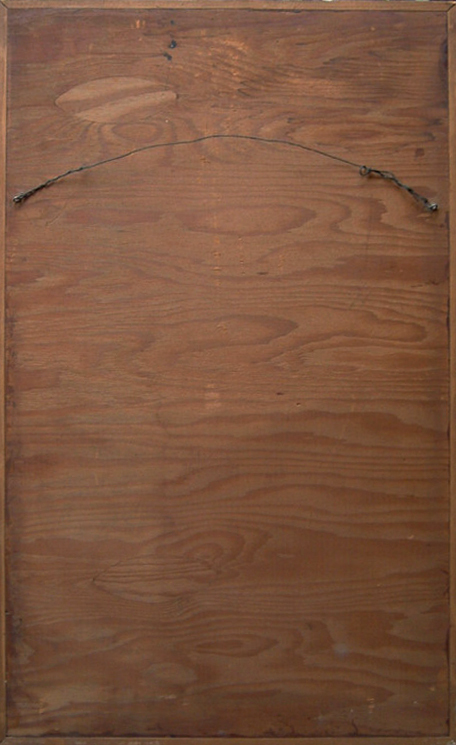 The seller doesn't have it listed as an Ackerman piece and I couldn't make out any markings/initials on the front or back. I wonder if it was actually created by Evelyn or is just a knock off? The thing that makes me doubt that the mosaic is an actual Ackerman piece is the fact that it is partially crafted from gravel and not entirely in smalti as the Ackerman mosaics that I have seen are. But, then I started thinking maybe it is a prototype or one-off? I am no expert, but I just got to wondering what if? OK, so then I asked myself "should I buy it cheap" and if it turns out to be an actual Ackerman piece consider it a score? or should I be honest and send the seller a note telling them to have it checked by an expert? hmmm...I have too much of a conscious, so I sent her an email. Below is the evidence. If anyone knows the answer to this mystery let us know. Left: Ebay mosaic piece. Is this an Ackerman piece or a knock-off? I'm so glad that you are a fan of my parents work. Just to let you know, they never used gravel in their mosaics and this mosaic is not one of their designs. Yes, I am a big fan of your parents!! Thanks for helping solve this mystery. As I said, I didn't think they used gravel in their pieces, I guess my suspicions were correct. Someone must have been a big fan of your mom's work. Thanks again for your comment!